Bach has more than 15 years experiences in practicing as a lawyer specialized in litigation and dispute resolution. Bach has become the 7th Senior Partner of BROSS & Partners, before joining BROSS & Partners, Bach established and managed Hong Bach & Partners Law Firm and played the role of Chairman of the Members’ Council. At early stage of his career, Bach had worked as Deputy Head at Pham Hong Hai & Partners Law Firm. 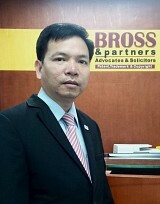 He is now holding Vice Chairman of Ha Nam Province Bar Association. Acting as defending lawyer for a director of an enterprise and a Head of Technical Department of a construction company who were charged with the crime of violation of regulations on occupational safety in a construction work in Hanoi City. Successfully protecting the residents in the lawsuit against the administrative decision issued by the People’s Committee of Dam Ha District on withdrawing the aquaculture mudflat in Dam Ha District, Quang Ninh Province.